Ken Wilber, the American author and academic, has spent over 40 years thinking and writing about various topics such adult development, developmental psychology, philosophy, worldcentrism, ecology, and stages of faith. His work formulates what he calls Integral Theory; an all-inclusive framework that draws on the key insights of the world’s greatest knowledge traditions. The awareness gained from drawing on all truths and perspectives allows the Integral thinker to bring new depth, clarity and compassion to every level of human endeavor — from unlocking individual potential to finding new approaches to global-scale problems. Welcome to the Integral Approach. Using the four quadrants to map your current state allows the coach and their counterpart to best understand the current landscape and choose the optimal approach required to move forward. The other elements are levels, lines, states, stages and types and all form various aspects of your being. 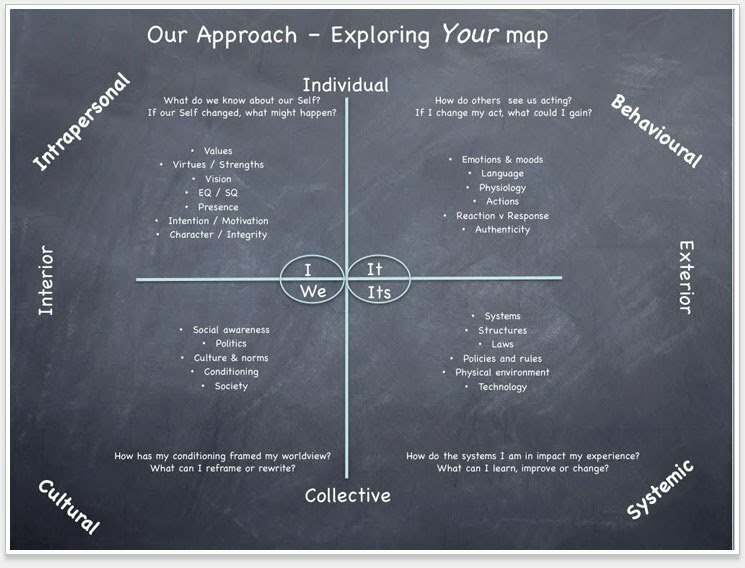 Your awareness of your own map helps you appreciate your story, perception, strengths, skills and behaviours and to select and exercise changes that accelerate your own growth and development to higher, wider, deeper ways of being.